Enjoying reliable Wi-Fi in your home doesn’t have to mean spending hundreds of dollars on a mesh wireless system. In fact, if you live in an apartment or a small house, you’ll be shocked at how affordable a high-quality router is. 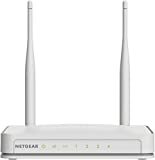 The NETGEAR WNR2020v2 Wi-Fi Router with High Power 5dBi External Antennas has more than 4,000 5-star ratings on Amazon and it’s on sale today for just $19.99. No, seriously, you can get a great router from a top brand that supports speeds up to 300Mbps for only $20!